The baseball/softball season is a long one with games played pretty frequently. The Little League fields that I help oversee has 3 fields — two 60′ and one 90′ diamond. Each of these fields sees approximately 400 events per growing season, including practices, league games, league tournaments, clinics, all-star practices and more. With all this activity, fields can get rundown quickly, especially if maintenance staff is stretched thin. 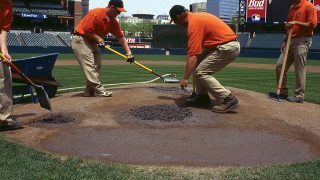 But just a little mid-season love can go a long way toward maintaining the integrity and aesthetics of the ball field. These five mini projects can pay big dividends. 1. Clean-up your turf edges. 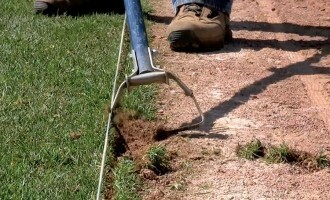 Many think turf edging is a lot of work but if you keep up with edging (just a few times per year!) it can be a fairly quick job that a couple of crew members can perform in a very short order of time. String your string lines right on the very edge of the grass so you are just trimming off the stragglers that are growing laterally into the skinned area. On curved areas such as the back arc or cutouts, this can be done by eye but it may take a little practice just to get the hang of making a smooth gradual curve. Use a scuffle hoe to take out any other individual rogue turf plants or weeds coming up in the skin areas. My crew at our Little League complex does this once a month and they can complete all 3 fields (two 60s and a 90) in about 5 hours. The sharp clean edges give the fields a professional look. This is also a good time to address any minor lip issues. 2. Scarify and level infield skin. This is not precision leveling, this is a quick down-and-dirty leveling job used for cutting down the usual high spots and filling in the routine low spots. This can be done easily if you own a three-wheel grooming unit Like a Toro Infield Pro with a box blade. Simply scarify the infield with the nail drag and follow up with the box blade to do a quick level job. For those that don’t have such a three-wheel groomer, scarify/nail drag your infield and use level boards to redistribute infield material from the typical high spots and deposit the material in the typical low spot areas. 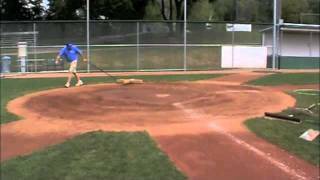 Finish by dragging the infield, but use your drag either folded in half or rolled up first to further help leveling, then complete the operation by dragging the infield with the drag fully deployed. Maintaining the surface grade to insure positive surface drainage requires constant vigilance and action to prevent the degradation of your surface grade from getting out of hand. 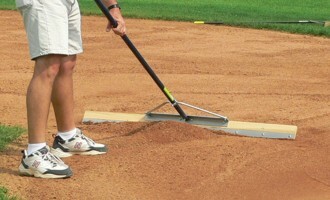 Again, like edging, the more often you do it, the less time it takes and the better your infield skin will perform. 3. Redistribute topdressing on infield skin. If your infield skin utilizes a topdressing material, that material will have a tendency to migrate due to rain, dragging, and play. The topdressing usually ends up on the low side of the infield as surface drainage and gravity will pull it there. On a typically graded infield, that means the topdressing piles up along the back arc of the infield. In order to take full advantage of having a topdressing on your infield, it is best to periodically redistribute the topdressing to insure a consistent thickness across the entire infield skin. This usually involves taking a level board and pulling the accumulated topdressing from the edge of the arc of the infield and pulling inwards and feathering it out all of the way to the high point of the infield skin. An even thickness of topdressing across the infield skin helps to promote a consistent bounce of the ball on the infield surface. On a 60’ diamond with infield grass, this will take 10 – 15 minutes. A 90’ diamond with infield grass can take about 25 – 30 minutes. You can essentially double the time for totally skinned infields of each of the 2 respective sizes. 4. 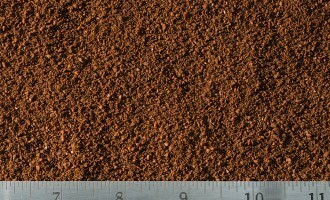 Reslope mound. It’s good to pull out the old slope gauge and check the front slope of the mound part way through the season. What it typically will reveal is that you may have been keeping up with the main wear areas but were probably slacking on the slower wearing areas between the high wear areas and because of that, the slope becomes inconsistent and out of whack. Clean off all topdressing and spoils on the mound so you can clearly see the condition of the level table at the top of the mound and the front slope. Using a level, add clay wherever low on the table and cut down any high spots with a sharpened iron rake. 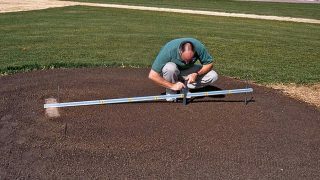 On the slope, use a mound slope gauge to accurately return the front slope to its proper specifications, adding clay or cutting down as needed. When finished, soak the mound, add new top dress, and soak again. Then allow to cure somewhat in the sun. 5. Give your home plate area a face lift. Much like the mound, the home plate area will also become all out of whack as well. Sure, you’ll repair the main wear areas, but around those there are areas that wear much slower and are not typically caught by the human eye day-to-day. Again, sweep all of the topdressing and spoils of and remove from the area you are working. This includes the batter’s boxes, the catcher’s box and the umpire area. More than likely the umpire area is too high and needs to be cut down. This results from the catcher kicking material back with his or her cleats as they get into position and the umpire then stepping on the spoils that were kicked out thereby packing them down and creating a high spot. Use a sharpened iron rake or a weighted x-drag to cut this high area down. Also x-drag all around the clay areas to take down any remaining high areas. Sweep clean again. Now you can see where the clay areas are truly low. Wet the area down and let the water be absorbed into the clay. Add clay and use a rake to spread out evenly and level. 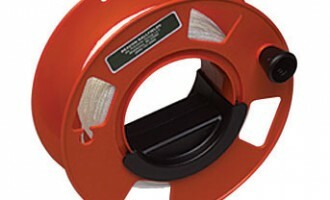 Compact with tamps and or a roller to fully flatten out. X-drag the remaining home plate area outside of the clay area. Use a level board to cut down high areas, fill low spots and generally level the entire home plate circle. Add topdressing as needed and finish drag the entire home plate area. If your fields are anywhere near as busy as ours are at our complex, follow these 5 mid-season ballfield maintenance tips to give them the boost they need to make it through the rest of the season, all while looking sharp and playing true.